People are shy, and definitely here in Belgium. If you don’t believe me, ask other conference speakers about the enthusiastic audience! An enterprise social network has a low barrier, so it’s really easy to ask your question. Interrupting the speaker is off course allowed, but as I mentioned before, there was a lot of content to be handled that day. So the more interruptions, the less content. It’s as simple as that. We needed a place where we could gather feedback during and after the event. On Yammer, you have something like a ‘Poll‘, where we can ask questions to the attendees like “how helpful was this session?“. This is a good metrics for us, the organizers of the event. We wanted an archive for us, but also for the attendees. At events, when someone’s asking an interesting question followed by a decent answer, you definitely need to keep track of that. Either by writing it down, or just keep it in your memory. If it’s on an enterprise social network, people have a place where they can consult information this information when they’re back at home. The social aspect: Getting to know fellow attendees! On Yammer, everyone (should) have profile picture. You also have additional profile information like the company that person is working for. On an enterprise social network, it’s a typical behavior to follow people so you can easily get in touch with them. An enterprise social network provides the functionality of uploading files and additional information to the network. Attendees have a single place where they can consult this information. Gone are the days of sending emails with links to the location where the slide decks are uploaded. 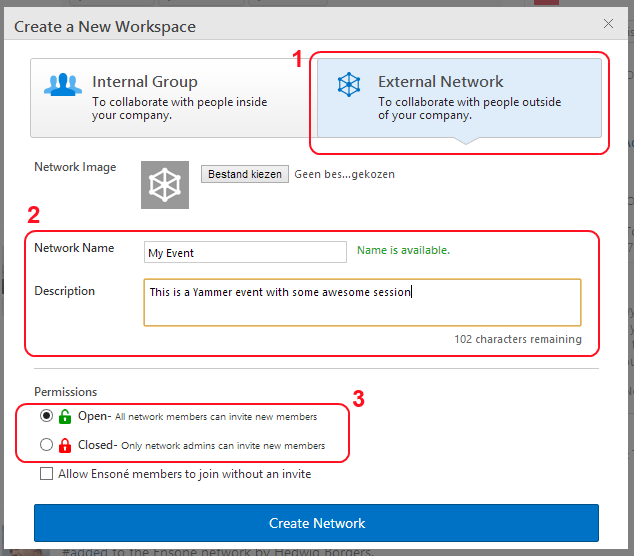 Include external people (Yammer or Microsoft people). If there was a question where we, as a partner, didn’t have enough information, we could easily invite the correct people to answer the question! Be sure to select the correct permissions. If you select “Open‘, people will be able to invite other members. So if we’re talking about a private/exclusive event or training with content that may not be shared, select the “Closed” option. That way, only you (or other admins of the network-to-be) can invite other members. It depends how many attendees you have for your event or training. In our case, we decided to send an “invite” the day before the event. Half of the attendees accepted the invite in less the 30 minutes! Don’t send it too far in advance, because people will tend to “forget” to accept the invite as the event is still far away in time. Note: At the keynote, we took some time for the attendees who didn’t had to chance to accept their invite to let them connect to the network. Next to that, think about a nice on-boarding experience. What do you want your visitors to experience when they accept the invite to join your network? If there’s absolutely no content, people will simply close the browser. Instead, make sure that there is a nice welcome message with some additional information about the network for example the goal of the network, some practical information like the time and the location of the event/training. It’s just about those small things that will make the attendee feel comfortable. In the keynote, we presented “2 simple Yammer Rules”. Use Yammer as much as possible! The “Quantitative” measurements simply focus on counting occurrences of a specific action. The most basic example would be to measure the frequency a user connects to Yammer: how many times has the user accessed the platform in the last day, week or month? The “Qualitative” measurements concentrate on the quality of a specific action. The easiest example is a user posting a new profile picture in Yammer; is it a good quality, recent and professional picture? If you use an automated solution, it’s easy to perform the quantitative measurements. The qualitative measurements are challenging. 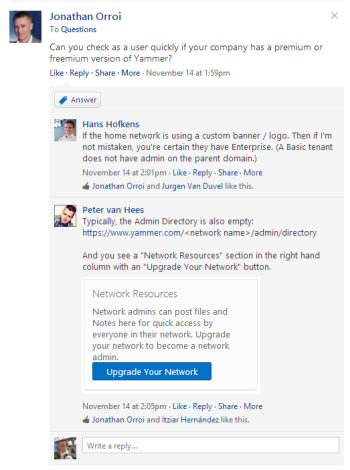 In order to address this, it’s important to train your Yammer Community Managers . The goal is define mechanisms – for example using topics – to ensure that qualitative information is identified manually, which can then be measured automatically. Something that I would additionally like to mention is YammerFall. This is third party application that displays a feed of live Yammer messages. As people followed the sessions they posted questions to the Yammer network, and they were displayed on a second projector in the room. Note: At this time of writing, YammerFall is offline. It was actually developed by a Yammer employee who left the company, and they are now re-writing some pieces. So expect an update soon! We’ve had some positive feedback about the usage of Yammer at the Yammer ignite event. We uploaded all slide decks and decided to keep the network open for the next 3 months. People are actually still posting questions to the network which is a good thing! If you decide to use Yammer yourself at an event or a training, you will not disappointed!